Psoriasis Treatments La Mesa CA - Can psoriasis go away on its own? An estimated 7.5 million Americans have psoriasis. Although it is more prevalent in adults, psoriasis spans all ages. About 40 percent of those who live with this chronic skin condition also experience psoriatic arthritis – joint pain and inflammation. As an experienced Board-certified dermatologist, Dr. Christopher Crosby is often asked if psoriasis treatments are necessary. He offers this advice for patients in the La Mesa, CA area. Psoriasis occurs from a fault in the immune system, causing skin cells to grow too rapidly. Instead of taking weeks to develop, they mature in days. Since the body cannot shed this overpopulation of skin cells quickly enough, they collect at the surface in patches. Plaques of thickened cells look silver-ish, and surrounding skin may be dry, cracked, red, or oozing. There are additional forms of this condition, but plaque psoriasis is the most common. 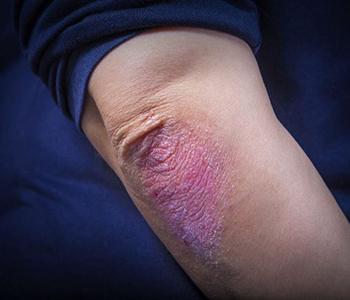 Can psoriasis go away on its own? Illness, infection, and certain medications. Psoriasis can temporarily clear on its own, but it is not curable. Professional treatment is essential to avoid permanent damage to joints and reduce risk of secondary infection from scratching or picking at plaques. Most importantly, effective psoriasis treatments restore self-confidence. The team at Grossmont Dermatology Medical Clinic in La Mesa, CA is committed to providing current treatment modalities to help you achieve clearer skin. The doctor may recommend topical medications to relieve itching, reduce inflammation, and slow cellular turnover. Phototherapy is very effective in more severe cases. A plant-based light-sensitizing formulation (psoralen) is applied. Then plaques are treated with a special UVA light. Some cases respond well to broadband UVB or narrow band UVB light therapies, without the use of psoralen. Excimer laser treatment helps to control scaling and inflammation. Great advances have also been made in oral medications and biologics (which alter the immune system). You don’t have to live with uncomfortable symptoms or anxiety about flare-ups. Call (855) 977-4949 to schedule an appointment at Grossmont Dermatology Medical Clinic.